Gasket quality is important, but design engineers and sourcing managers also need to consider material costs. 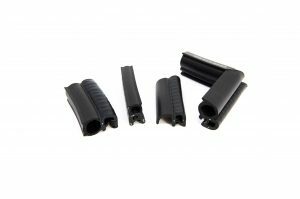 This includes not just the gasket rubber, but also the method of attachment, such as clips, fasteners, or liquid adhesives. 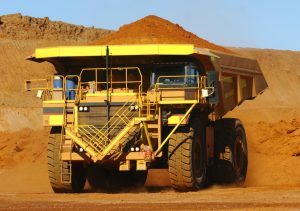 Engineers and buyers also need to consider the tools, skills, and capabilities of the personnel who will install rubber gaskets for mobile equipment. Outsourcing your gasket fabrication may seem expensive, but consider your true costs. Rubber gaskets that are custom-fabricated and installed properly emphasize the quality of your mobile equipment. When a potential buyer enters a cab, door seals with clean cuts and a snug fit make a positive first impression. So do well-made window channels and weather stripping. 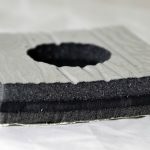 If a rubber part is poorly cut or installed improperly, you may not get another chance to convince a potential customer about your product’s most exciting features. There are labor and material costs to consider, too. Cutting a length of rubber with a utility knife may seem cost-effective, but what’s the cost of material waste? If an operator measures or cuts incorrectly, the length of rubber will end up as scrap – and the sourcing manager may never know. There are also labor costs to evaluate. How long does it take to cut the right length of rubber, bond the gasket, and apply it to the body or door? Once the gasket is installed, how long will the seal last? For mobile equipment manufacturers, bonding cut lengths can be especially time-consuming. The employees who perform these operations may be highly-skilled in other areas, but they don’t specialize in gluing gaskets. 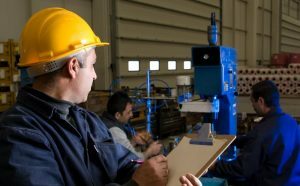 Asking a metal fabricator to bond rubber might make sense if the employee is idle, but expect some material waste – especially if employees don’t have the tools, skills, or experience in gluing gaskets. There’s also the opportunity cost of having employees who are skilled in other areas spend their time on gasket fabrication instead. Elasto Proxy custom-fabricates door seals, weather stripping, and window channels that add value to your mobile equipment. At our manufacturing center near Montreal, Canada, we use water jet cutting equipment to cut lengths of rubber with speed and precision. Because of the accuracy and tight tolerances we can achieve, Elasto Proxy eliminates the material waste that’s associated with utility knives and box cutters. Water jet cutting avoids tooling costs and supports quick-turn prototypes, too. When gasket cutting is finished, Elasto Proxy bonds your cut lengths together. 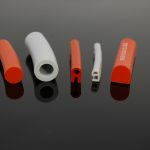 Film splicing, cold bonding, C-press injection molding, and vulcanizing each have their advantages. Infrared splicing does, too. Typically, selecting a splicing method depends upon run quantity, performance requirements, material type, and tooling costs. That’s why our technical team analyzes all of your needs before recommending a splicing method. Our skilled production personnel then create the strong, reliable bonds you need. Elasto Proxy also provides kitting services and taped gaskets. So when your door seals, windows channels, or weather stripping arrives, just open the box. Everything you need is inside, and your assemblers won’t have to use hand tools or apply messy liquid adhesives. Installing a taped gasket is as easy as peeling the release liner and sticking the rubber part to the door or body. 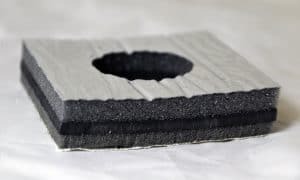 Elasto Proxy fabricates cab insulation, engine bay insulation, and rubber floor mats, too. 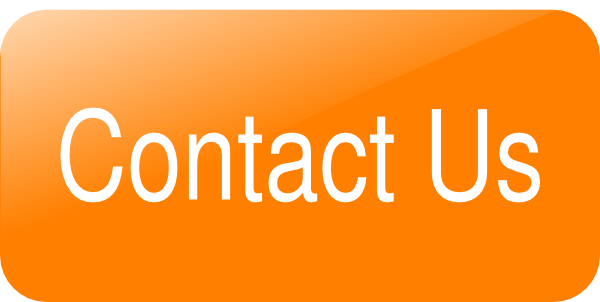 For more information about how custom gasket fabrication can save mobile equipment manufacturers time and money, contact Elasto Proxy.